Scalarama Film Festival and the Importance of our Film Community! We all know that the start of a new calendar year sees all the fancy awards ceremonies and that summer is Blockbuster season for new releases. Are you aware of the importance of September in a film fan’s calendar though? A now international film festival occurs, which sees Nottingham’s film showing community come together for a month to put on some awesome events and this is the first year that we get to be a part of this iconic film festival – it is safe to say that we are excited! 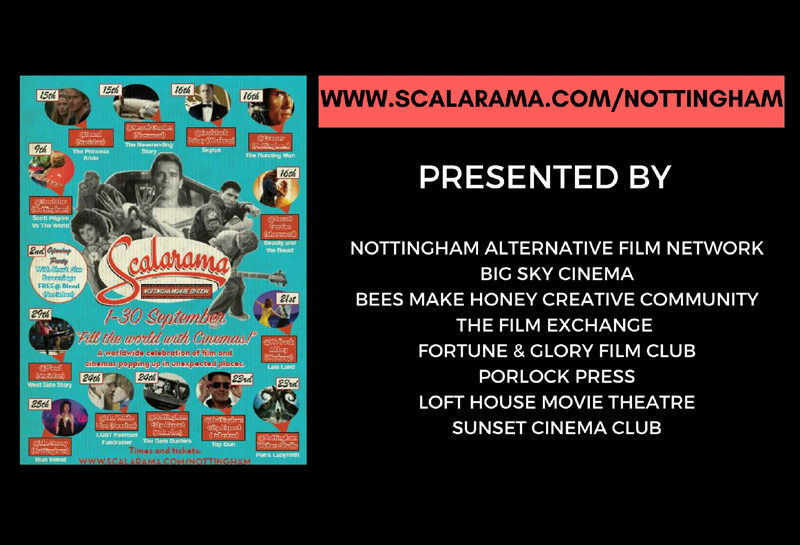 So what is Scalarama ? Seven years ago a one-off film festival began in London, occupying a few bars and cafes who put up temporary screens and offered a cinema experience to audiences. It’s grown year on year, and now in its sixth year Nottingham sees many film clubs and societies band together and curate a programme that tries to show things a bit more unique. The primary intention of Scalarama is to ‘fill the land with cinemas’ and working with a pop-up cinema we certainly fulfil that requirement. It’s all about turning unexpected venues and spaces that wouldn’t typically be related to films into something different for a night or a series of screenings. Now several years on Scalarama involves over 70 locations internationally and supports hundreds of film clubs in its pure intention of building cinemas across the land. Nottingham has played a significant part over the past few years and this year was no different as the city hosted some unique events and collaborations. It’s a selection of eclectic and exciting content, you’re likely to see films that you’ve never heard of, enjoy classics in new ways that you never thought possible and you are likely to make a bunch of new film obsessive friends to share your cinematic adventures with. Take a look at the trailer below to see what was on offer this year, besides our own events we particularly loved the collaboration of Porlock Press and The Film Exchange’s interactive screening of The Running Man at Laser Quest and Fortune and Glory Film Club’s screening of Scott Pilgrim. We personally delighted a bunch of true film fans who quoted The Princess Bride word for word, worked with a new venue and screened this year’s big Oscar winner La La Land at Welbeck Abbey and continued the musical vibe with a screening of the iconic and very special West Side Story at Blend – it was rather busy , if you have any suggestions for what you’d like to see next year, let us know! One of the beauties of cinema is being able to bring people together, allowing fellow fans to quote along and enjoy the experience. So when multiple film groups, clubs, societies and cinemas come together to combine their film picking powers, it is nothing short of brilliant. 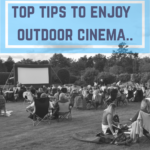 Something that we have learnt this season is that when watching films outdoors under the stars, these feelings of community are heightened with sing-a-longs and audience participation. 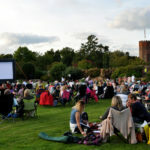 We recently ended our summer season with Mamma Mia at Hodsock Priory and Rocky Horror Picture Show at Blend – and one of our favourite moments was the giant sing-a-long as the credits rolled, as everyone was just so happy and having a great time at both events. Film as a medium really does bring people together. For us, cinema offers the chance to indulge in some escapism, and we hope that we provided that across September. We’re already looking forward to next year’s Scalarama programming. If you missed out this year, then take a look at the trailer to see what to expect in 2018 when Nottingham’s film community reunites once more. If it’s ok we would like to share our story with you. 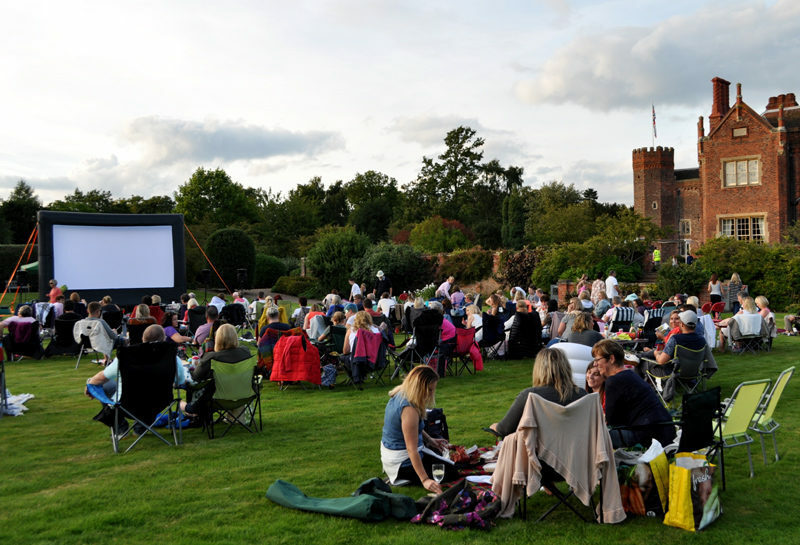 Seeing as we hosted our first UK film screenings last month with a nostalgic evening with Back to the Future in Nottingham City Centre with Blend, followed by the magical Beauty and the Beast and new family favourite Moana at Hodsock Abbey. It was a quite a month, we faced British weather for the first time and our audiences delighted with picnics in the grass and enjoying the gorgeous vocals of talented performer Jenny Skuse before we jumped in with Doc and Marty over at Blend. Sharing stories on the big screen in beautiful outdoor locations is something we love that we get to do. We thought we would take a little time to introduce ourselves and talk about how Big Sky Cinema came into being and our own story. Interestingly we are a branch of a Social Enterprise, and our profits are reinvested to supporting schemes within our social mission and charitable objectives via our parent company Eudaimonia. So every time you see a film with us or hire us you’re doing a good deed too. How great is that? Big Sky Cinema currently consists of three individuals who bring a vast amount of experience in film and events to every screening and the experience that can we provide. Steve, Iain and Amy all pride themselves on their detailed level of customer service that they provide and are all film lovers – but their taste is hugely different! You can find out more about the team here. Big Sky Cinema interestingly didn’t exactly begin in England; it was born many, many miles away in Africa – in Meru to be precise. Eudaimonia works with people in Meru to better their lives and provide new opportunities and in the summer of 2014, following three years of research and working on funding grants and launching a Kickstarter campaign where things sadly didn’t quite fall into place, and we were not able to provide what we wanted too. That’s the first time Amy and Iain worked together, as at the time Amy owned Screen 22 Cinema where Iain and team filmed the video segment of the Kickstarter campaign we later launched. It really is all about the people you meet. Fast forward three years later, and Iain and Amy will regularly be found discussing recent film releases, classic special effects and some very obscure films from eras gone by, as they inflate the cinema screen and check the sound levels before the film plays for you. We intended to create a film showing community which was to screen local work alongside screening mainstream and classic film releases. Our intent and wishes were to provide a cinema with proper sound systems and sophisticated screening equipment, as unlike here in England in Meru and similar places they don’t have access to several purpose-built cinemas per city – it can take up to a day to travel to the nearest Picturehouse, and we wanted to help! As we all know not all plans work out, but if you don’t take a chance, then you will never know what could be. The project sadly ran into some complications (and then our gear got stuck in customs for eight months! ), and due to factors out of our control, it sadly failed. So a decision was made to try something in the UK and nearer home, and that’s what the next few months are set to be. We have found some excellent partnering venues and people to work with, from grand historic houses to inner-city new locations – we will even be popping up Big Sky Cinema on a local football pitch. 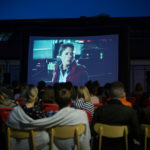 The beauty of pop-up cinema as a concept, is that we can create a cinema environment pretty much anywhere in the open air for a vast range of audiences and share our love of film. Something very different that we can offer at both public and private events is freshly prepared and cooked catering. Part of the company is The Super Kitchen which includes our own fantastic food truck, coffee blend and we can even cater food to compliment the genre of your screening – for instance homemade ice-cream alongside Frozen or 50’s based milkshakes and burgers as you kick back to Grease?. No request is too big or small – we want to work with you to put on the best event that you can so please get in touch. You can find out more about the rest of our film season by following us on Instagram or Facebook or let us know your favourite films over at Twitter – please send us your photos and comments, as we do this all for you and would love to see the memories we have helped create. Copyright © 2018 BIG SKY CINEMA. All rights reserved. Big Screen Cinema entertainment in wonderful outside locations, with sound system, catering options, food truck & popcorn machine! Copyright © 2019 BIG SKY CINEMA. All rights reserved.